Two Macedonian citizens, who were kidnapped last week near Basra and held hostage, were released yesterday after ransom was paid. Faruk Ademi and Rasim Ramadani were kidnapped the morning of 16 February near Basra, where they worked for Ecolog, a multinational contractor of the British army. "It happened near Basra. The Iraqi police are informed of the incident and are investigating" said he. According to Cripps, the two were together with another colleague at the time of the kidnapping, a German woman. Whereas they were taken, the woman was released to pass the ransom note. Reportedly, the Macedonian citizens were captured by a known criminal group which runs kidnapping for ransom as regular activity. Rasim Ramadani, originally from Mala Recica near Tetovo, has been working with Ecolog as a quality controller at the Basra airport for 1 year and four months. Faruk Ademi, a more recent employee with the company, has worked at the same location, as airport logistician. Immediately after the kidnapping, senior Ecolog officials entered into negotiations with the kidnappers, which resulted with the successful release of the hostages 5 days later. Unofficially, the ransom paid was 1 million dollars though this amount is not confirmed. Ecolog has had 4 cases of successful release of abducted employees in Iraq in 2005. 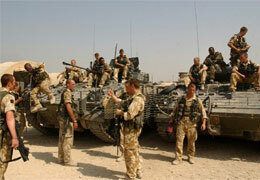 The company is a long term contractor for logistical services of the British army. It has its subsidiary in Tetovo, Macedonia, which does regular recruitment for Ecolog's operations in Iraq. Estimated 1.000 Macedonian citizens are said to work in Iraq, most of them employed with Ecolog. They work for an average salary of 1.500 euros. Most of the Macedonians who work in Iraq are of Muslim faith, which is considered to be of great advantage in a case of kidnapping. Reportedly, Ecolog had another case of kidnapped Macedonian employees last year. The case was quickly resolved by ransom without the media getting to know about it. According to word-of-mouth by other Macedonian citizens working in Iraq, there had been quite a few cases last year of Macedonians being snatched and afterwards released, after determined that they were of Muslim affiliation. The Macedonian Government had early information about the incident but it didn't inform the media, until the news was run by international press. "The Government was informed of the kidnapping and all necessary measures were taken", said initially Agim Jonuz, the Government's deputy spokesman. According to the Foreign Ministry, the government was asked to keep the media out as negotiations for releasing the hostages were underway. The Government didn't involve in the case operationally. Reportedly, it left it to the officials from Ecolog, as they have had previous experience with such matter. Macedonia press speculated that the Government would not have been ready to pay the ransom if asked. "The Government works with our partners in Iraq, with Iraqi authorities, with the British forces in the region of Basra who control the area, as well as with the company which is in contact with the kidnappers. The company runs the negotiations, not the government. We will do everything in our power. We haven't been asked for money, but I said that we will do everything we can to save the lives of our citizens. You make your own conclusion" stated Emil Kirjaz, state secretary of the Foreign Ministry, replying questions about possible ransom payment by the Government. The families of the kidnapped stayed in anxiety until yesterday morning when they got the news of the release. "I got a call at 5.30 this morning from the owner of Ecolog in Tetovo, Mr. Nazif Destani. He told me that my son has been freed. Then, I spoke for 15 minutes with my son; he told me that they were fine and that they were not mistreated", said obviously excited Mr. Sheref Ademi, father of Faruk. Ecolog's representative, Mr. Luan Tresi, said that both hostages were fine and that they were to be transported to Skopje today or tomorrow, with a company's private flight. "The case has been successfully resolved. Now we cannot wait to put them back with their families", said he. State secretary, Mr. Kirjaz thanked the Iraqi authorities, the international forces and the representatives of Ecolog for their cooperation. "Both of them are at a safe location and they are soon coming to Macedonia", stated Mr. Kirjaz, "In the interest of the safety of our other nationals, who are in Iraq at their own initiative and risk, the Foreign Ministry will not report any details regarding the release". Mr. Kirjaz reiterates the general warning of the Macedonian Foreign Ministry "that due to the security situation in Iraq, Macedonian citizens are advised not to travel or stay in that country". In this case the drama was short and with a fortunate outcome, quite evidently because of the principled and compassionate position of the hostages' employer. In 2004, three Macedonian citizens from Kumanovo were kidnapped in Iraq. Dalibor Lazarevski, Dragan Markovic, and Zoran Naskovski were the first Macedonian nationals kidnapped in Iraq. Their death was officially confirmed by a special government team after an analysis of a video tape of an execution originally obtained by Al Jazeera. According to the government's team, which had analyzed the tape at Al Jazeera's headquarters in Qatar, the identity of the executed could be determined by their clothes. Their bodies had not been discovered to date.